New Holland’s range of large square balers offers farmers the choice of five different configurations to suit silage and hay applications. What each option has in common is that it produces uniform, well-packed bales that make for easy storage and transportation. "The BB940A and BB960A balers are high capacity machines ideal for contractors or farmers who need high output and versatility to work in hay, straw or silage," says New Holland’s Manager Hay and Harvest, Jason Vowles. "They are adaptable, reliable, industry-leading machines." The BB940A, with an 80 x 90 cm bale chamber, is available in PackerCutter, PackerFeed and RotorCutter configurations. Its big brother, the 120x90cm bale chamber BB960A, has PackerFeed and RotorCutter options. "The Packer Feed is perfect for the farmer who is making lucerne bales, while the PackerCutter on the 940 - a six knife cutter feed system with triple crank packer tines – adds the option of slicing and is popular with contractors. "The CropCutter is the big gun, a 0>33 knife rotor cutter feed system that takes crop directly from the pick up. It’s a more aggressive system that can chop the crop much more finely and again is ideal for contractors," Jason says. Both the BB940A and BB960A feature New Holland’s InfoView system for bale monitoring and diagnostics. "InfoView makes baler control simple. It gives the operator total control, with the ability to create pre-work settings as well as on-the-go adjustments. The easy to read LCD screen and simple scroll keys mean clear and useful information is always at hand." Jason says the BBA balers are machines that produce neat bales. "These models feature our patented double knotting system, which is gearbox driven, auto-greased and shear-bolt protected to produce neat bales in any condition. The BB960A produces bales with outer edge twines more than 25mm closer to the edge than competitive brand balers. Having double knotters eliminates twine pull-out and mis-ties, especially in silage, where friction and twine drag can be problems. The low wearing knotters are field-proven for high strength and reliability. " 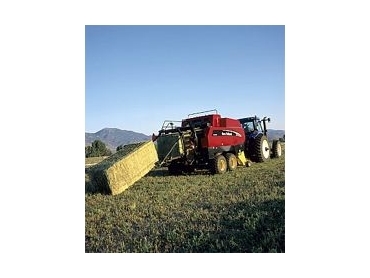 The balers have been designed to feed and compress the crop quickly, quietly and easily. "It’s important to farmers that they are able to reduce wastage, improve mixing of feed rations and ensure good fermentation of silage for better quality bales. All of New Holland’s innovations are about achieving these aims. "The shuttle feeder pre-compression system, exclusive to New Holland, adds density before the main bale formation process, while the trip door system maximises density by preventing the crop from entering the main chamber until the desired density is reached. Direct drive from the gearbox to the plunger keeps the operation smooth, precise and quiet." "With our innovative technology and the varying options, it is easy to come up with the right machine for every application."